So, what did everyone think of the game last night? Many – in fact the majority – of my friends would probably not know which game I am referring to. This is a shame. Those that do will be split – not 50/50 I’m sure but split nonetheless – in to two camps: the enthusiastic and the condescending. While both are entitled to their own views, they are not writing on this site, so I am the only one with anything relevant to say here I’m sure. Comments welcome. I am prompted to write because of the outpouring of vitriol on my chosen social media sites. Many of my friends, especially those who have chosen to spend time either in the USA or watching the sports programming which is beamed across the Atlantic, will know that last night was the culmination of the NFL season. Some of you I’m sure will still not know what this means. I’ll clarify – it was the Super Bowl – the FA Cup of American Football. Two teams of padded and be-helmetted giants of the game – alongside their more diminutive but just as skilled cohorts – took to the gridiron to battle for the prestige, notoriety and – let’s not forget – sponsorship and cash bonuses a Super Bowl winner can expect. So where is this vitriol from? It’s simple. Many people, certainly in the UK, think that American Football (or football, to most North Americans) is a ‘boring’ game. Or predictable. Or – and I’ve heard this many, many times – that it is just a game of Rugby for pansies. Well, you are wrong. It’s fair to say that YOU may find it boring. This can be for a number of factors. Perhaps you don’t understand it. I’m sure if you were watching any activity for the first time, you would not connect with it. You would certainly not be able to form an opinion of your favourite team – colour of jersey excepted of course. But the fact that YOU find it boring does not make it so. It would be fairer to say ‘It bores me’ – truthful and more appropriate. This may seem pedantic, but look at it another way. There are over three hundred million people in the USA, of whom approximately 40% watch NFL matches on at least a monthly basis through the season. That’s over 100 million – much more than the population of the UK. 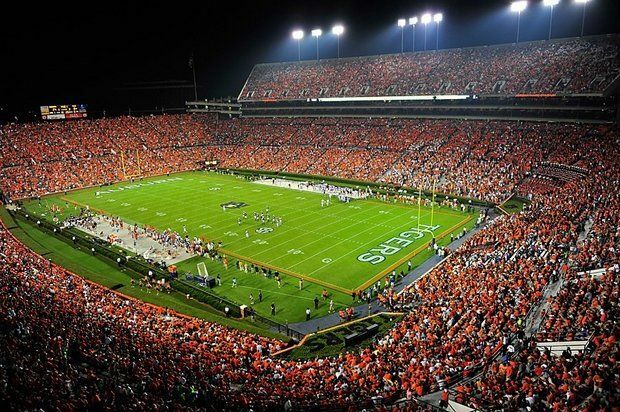 Crowds at COLLEGE football games regularly exceed the spectators of premiership football matches anywhere in Europe. That’s equivalent to filling the Emirates stadium or Old Trafford to watch Oxford Vs Cambridge Rugby. The NFL is holding matches in 2014 in stadiums throughout the UK, and these SOLD OUT within a few weeks (http://www.nfluk.com/tickets), without major advertising. So, YOU are bored, and you are in a minority. Nothing wrong with that. Frankly, I don’t understand this, but it has been said. The only thing which lends it credence is possibly the American fascination with statistics. This does lead people to think that because even a new fan can tell you how many sacks a tackle has been credited in the last three games, or how many yards rushing a wide received has run, this is no indication on how the ext game will go. An if you think ‘HandEgg’ as some call it has an affection for stats, you will be amazed at what baseball fans know… Relating it to last night’s game – predictable is not the word which would come to mind. Seattle ‘pounded them until they couldn’t receive another ball’ – very funny, very true, and the opposite of expectations at the beginning of the game. Well, this one I have heard too many times. Let’s skim over the basics of the game and relate this to whether or not the players have pads and helmets on. No-one remarks that Webber, Hamilton and Vettel use CARS to get around the racetrack. A proper sportsman would just RUN, surely. Same goes for those fairies like Hoy and Boardman, on their fancy bikes. Oh, and no running in shoes please, they are for softies. The pads, helmets and the rest of the equipment these athletes wear are tools. They are not to prevent pain, just to ward off the worst of the injuries which could occur. Despite wearing thick protection, concussion is still the most prevalent injury throughout the NFL after ankle and wrist damage. If you want to check whether these guys are weaklings, I suggest you challenge them to a quick face off – either with or without the pads. I’m guessing, when you see six foot five and three hundred pounds crouched a few short yards away on the grass, waiting for the snap of a ball to decapitate you, you may well change your mind. OK, so you don’t like it. Don’t watch it. That’s sorted then. Please don’t rant about how boring you find it as a sport. They do have boring games, but last night’s was not, in my opinion, one of them. Lets face it, while the USA may not be the best in the world at developing new sports (that’s our trophy) they are the leaders when it comes to making them big. From the pre-match build up to the post-game show, this is truly entertainment for the whole family. ‘Soccer’ and the rest of them could learn a lot. And, like Rugby and other proper sports, where the combat is carried out on the pitch, there is no segregation of fans. Red and silver sit cheek-by-jowl berating and cajoling with shared breath. Long may it continue. Well done, Seattle. See you next season, but please let the 49ers win the NFC East next year.